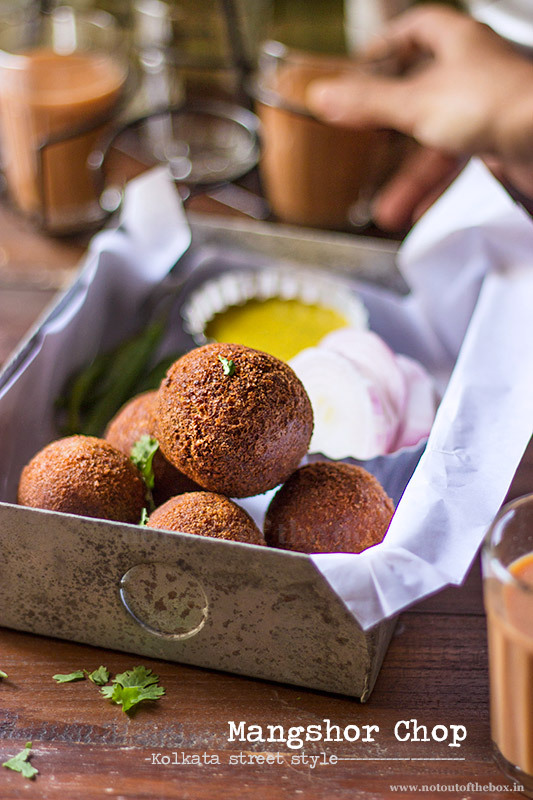 Mangshor Chop (Mutton Croquettes) is one of the most popular chop varieties found in Bengal. But it’s not easy to get a good version of the same always. And here in Delhi, one can find these in Chittaranjan park, but let’s not talk about the taste of those chop. A bit more work, but I prefer to do it because the end result is so tempting. And now I store the croquettes in freezer bags and enjoy them throughout the month, so, I made this time a big batch of it. 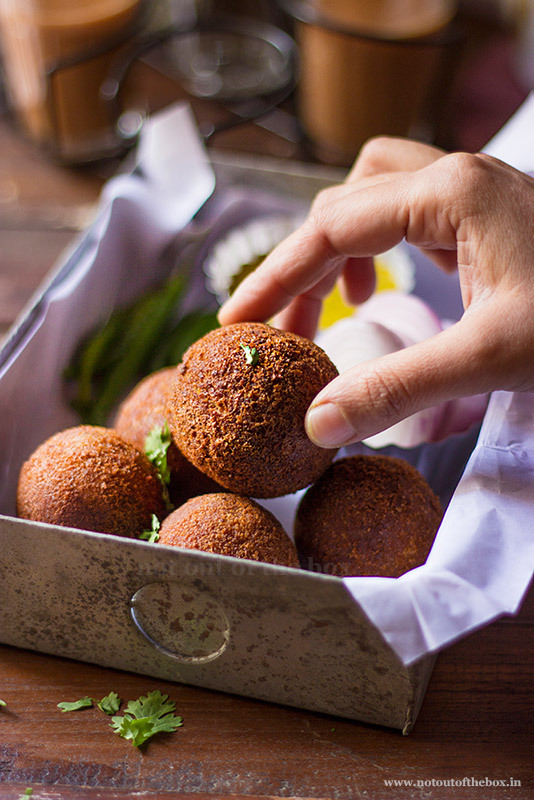 Crisp outer shell breaks to a soft, flavourful minced mutton goodness inside, Mangshor Chop is pure nostalgia for me and don’t forget to dip them into kasundi for each bite. Heat mustard oil in a deep frying pan or kadai (nonstick preferably). Temper with bay leaf, cumin seeds and dry red chillies. One it splutters add sliced onions, sauté on medium heat until light brown in color. Add ginger-garlic paste, cumin powder, coriander powder, kashmiri mirch powder and turmeric powder. Mix and fry on medium heat until the masala starts leaving oil (1-2 minute max). Now add mutton keema, salt and green chillies. Mix well, cover and cook on low heat. Keep stirring in between. Add mashed potatoes when mutton keema is half cooked. Add Garam masala powder, roasted cumin seeds powder and sugar when mutton is thoroughly cooked, mix well. Keep cooking uncovered for 2-3 minutes more. Do all this on low heat. The Keema for chop is done now. Remove from the heat and keep aside. Now start making round chops/croquettes from this mixture, keep aside. In a bowl, add besan, water and salt, whisk well to form a lump free thin batter. 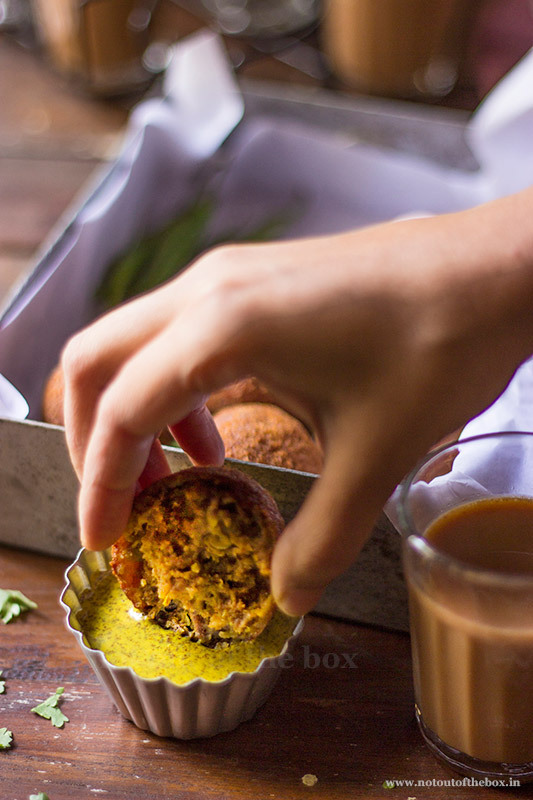 Dip each chop in this besan batter and then roll into ground cornflakes or bread crumbs whatever you are using. Repeat these steps again (dipping+rolling). Double coating is an important step in chop making. Heat oil in a deep frying pan. Add 1 cup oil at a time. Fry the chops on medium heat until golden brown. Drain on paper napkins, your Kolkata style Mangshor Chop are ready. Serve immediately with Kasundi (Bengali mustard sauce)/ tomato ketchup and some sliced onions. 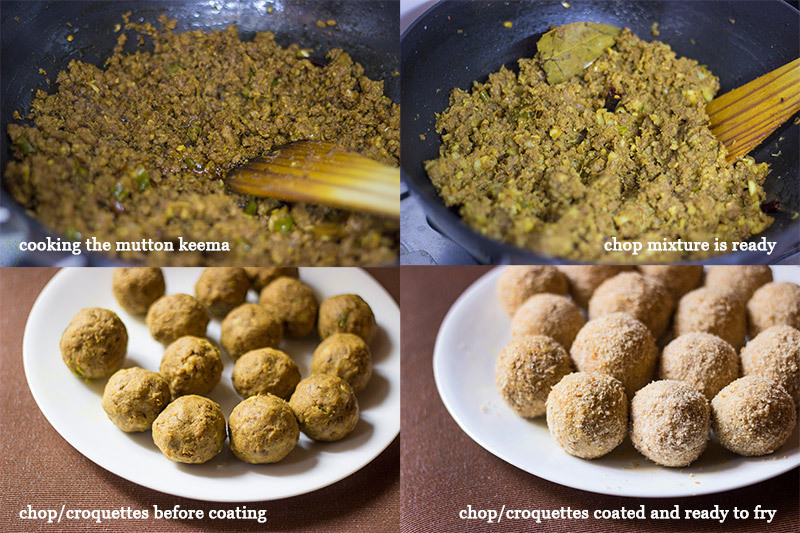 To make the croquettes eggless I used besan mixture as a coating. And there was no difference in taste. But if you want to use eggs, just mix 3-4 eggs with little salt. Dip the chops and then roll into breadcrumb. For longer storage, keep them in zipper seal freezer bags. Take out of the freezer and you can fry and serve them immediately. They can be stored like this up to 2 months.